It's been a few days since Dallas Comic Con 2014 ended but I've been meaning to write something about this since the final day. I just needed a few days to collect my thoughts, collect some photos and talk with other people about what they had seen and compare experiences. Understand this - I enjoyed myself immensely this past weekend. What follows is not an attempt to tear down what I think has the potential to be one of the best conventions in the country, if not the world. I just want to make sure that in all the excitement over the confirmation that this was officially the biggest convention in Texas history that we do not forget that quantity and quality are not necessarily synonymous. 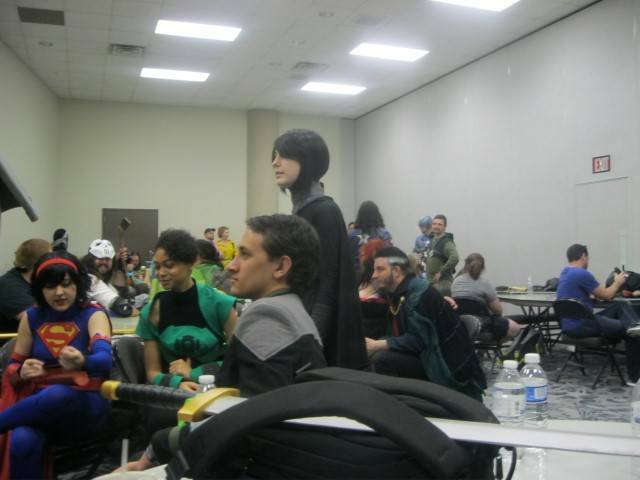 It has long been a running gag among local fans that - much as the Dallas Cowboys do not actually play in Dallas - The Dallas Comic Con has never been held in Dallas. That changed this year in a big way, as DCC was held in downtown Dallas at the Kay Bailey Hutchison Convention Center. The fact that this year's convention would be held in a larger venue was a much hyped selling point. 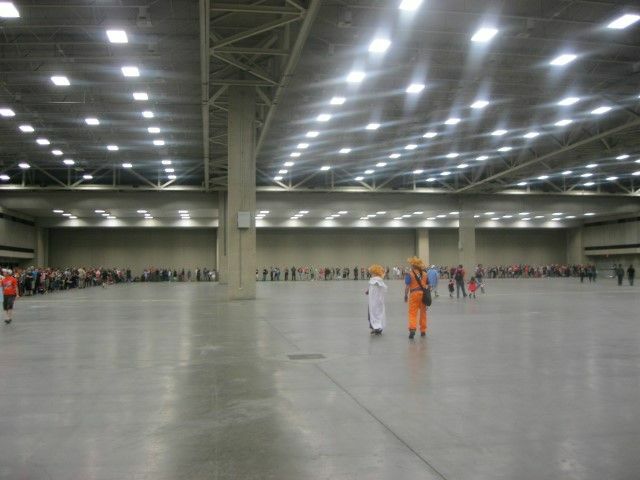 But the biggest benefit - at least for those of us in multi-layered costumes or prosthetic make-up - was that this allowed the con to open up an entire wing of the convention center as a waiting area. May in Texas can be like August in other parts of the country, so having a climate controlled place to wait in line before the show started was a welcome change. I know I've come close to sweating off my spirit-gummed Green Arrow beard while waiting in the parking garage of the Irving Convention Center! And I'm sure even the people who weren't in costume appreciated not being out in the sun at two in the afternoon on Friday. Not only was their more space this year but the space was better utilized. 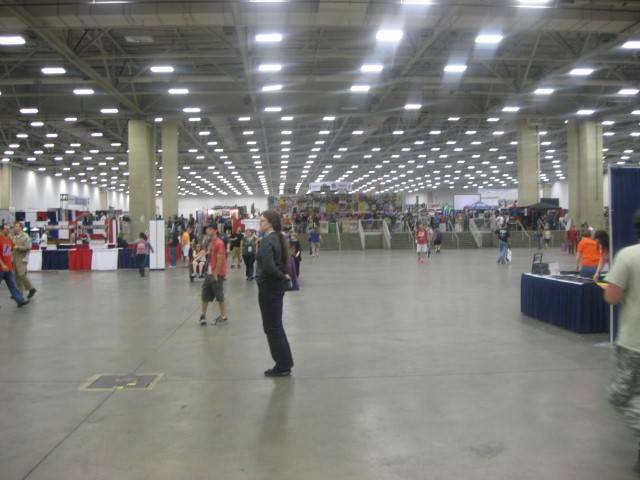 The aisles in the Dealer's Room and Artist Alley were nice and wide. And Friday in the autograph area was downright spacious! Even at the height of the con on Saturday, there were few traffic flow problems and then only around the exits during major panels. 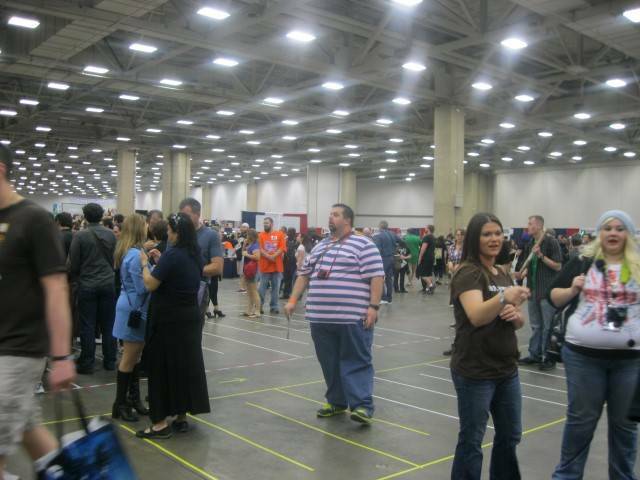 There was plenty of room to move around the autograph areas and space enough for cosplayers to pose. The innovation of Jacob Long and North Texas Cosplay. this cosplayers-only lounge offered costumers a place to work on emergency costume/prop repairs. A wide variety of supplies were available and skillful volunteers were there to lend a hand. The lounge also offered a place where cosplayers could sit and relax between shoots, without fear of being bothered about posing for photos. One new innovation this year was a lounge for those with Premium passes. After a few hours walking on a concrete floor, having a place to sit down and get off your feet for a moment without fear of blocking an aisle was a welcome thing. 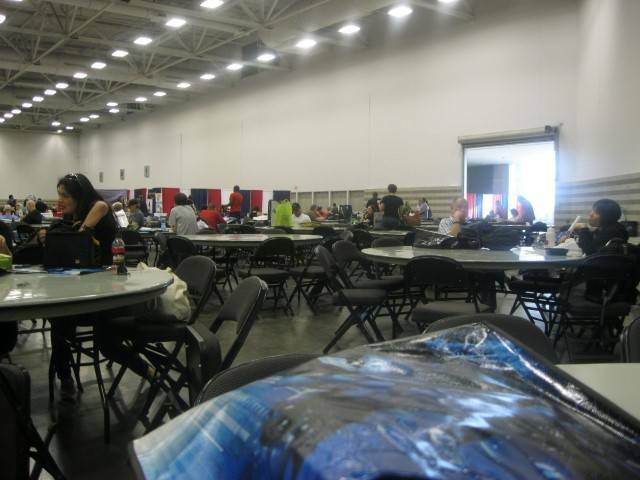 The convention center also had a number of food courts with seating areas, so even those who didn't spring for the expensive tickets still had places they could just relax for a little bit. On Friday, there were a number of DPD officers on-hand checking weapons. I showed them the bow and trick arrows for my Green Arrow costume on my way in. I assured them that the bow would not fire at full-force (I had a rubber band looped around one end of my bow-string) and showed them that my arrows were all padded on the ends. I was surprised then that they didn't bother - as in years past - to tie some colorful flag around my bow or the individual arrows. They said they didn't need to after I asked them about it. Later that day, I ran into another Green Arrow cosplayer who was carrying an unstrung fiberglass bow. When I asked him about it, he said that security wouldn't let him in with the bow strung, despite his not having any real arrows. This was not the first oddity involving weapons and weapons checks I would encounter as the weekend progressed. At some point during the weekend, it was decided that all metal props would be banned. This rule was not advertised on the convention's props & weapons policy page. That said, I can see the sense in it - metal props hold more weight and it's a bit more difficult to spot metallic prop guns as fakes. And given the problems Dallas has been having of late with open-carry protesters trying to carry their assault rifles into public events, I can understand the convention's position. This did however lead to one of the odder - and seemingly hypocritical - elements of the convention. Metal weapons props aren't allowed and yet a number of vendors sold metal weapon props. The eventual solution was to ask people to leave their purchases with the dealer until they were ready to leave for the day and then pick them up on the way out... even though most of the dealers were selling their merchandise boxed-up and instructing people not to open it up while at the convention! A larger problem are reports that the weapons check booths were completely unmanned after the opening rush each day. I can confirm personally seeing that the Weapon's Check station by the main entrance into the dealer's room was unmanned on Sunday afternoon. Granting it is unlikely past a certain point that anyone would try to enter the convention with an unchecked prop, the possibility should still be guarded against. It's fairly standard practice at a convention like this for certain rules to be set down regarding the biggest name celebrities. No personal photos at the autograph table. No extended conversations. And no touching unless they offer to shake your hand first. It's a bit like meeting The Queen of England, only with more people in orange t-shirts yelling at you about how much money you're paying for the privilege and how you need to have your cash ready. Now, I understand why this is a necessary evil. You have to deal with the creepers who had no understanding of personal boundaries. You have a lot of people waiting and don't want to let the guy who has a brilliant idea for how One More Day could be done away with chewing on Stan Lee's ear for two minutes. And it's hard for the photography studio that manages the photo-ops to make money if anyone can just snap a picture with their favorite actor. The problem is that these rules were enforced somewhat haphazardly, if they were enforced at all. I spent the better part of two hours waiting on an autograph from Nathan Fillion. When I asked about personalizing the photo, he apologized but said he wasn't allowed to professionalize the signature. I can understand time being of the essence but I'd think most celebs would take the time to write "To Frank" or whatever else was requested if it ensured that this photo was a treasured keepsake and not ebay bait. Curiously, while Nathan Fillion had a longer line, I think it took longer for people to see Summer Glau. This was because Summer was all too eager to let people behind her table to take a selfie and seemed to take her time with each fan. I don't know if this was because she wasn't considered as major a draw as Fillion. But it was still a vexing point and I heard similar tales regarding other actors doing autographs and various "line-Nazi" volunteers abusing their power. There was no security or con-staff in the dealers area. None. All of the orange-shirt volunteers were confined to the autograph area. Apart from the people watching the entrance to the Premium Lounge it was all but impossible to find any con-staff in the dealer's room or artist alley. I heard more than a few stories about vendors losing product and that the only time some of the folks in Artist Alley saw a con volunteer was on Friday during set-up... and then only to be informed that they needed three kinds of badges in order to unload their merchandise! 4. Where Are the Comic Creators? The venue really could have found a better place for the comic creators to be placed than at the very back of the dealer's room, behind Artist Alley. Sure, the map in the program showed where they were... but with the VIP entrance going directly into the autograph area and the regular entrance emptying into the dealer's room, it was very easy to get lost among the aisles and turned around. I think the autograph area is big enough that another aisle could be set up for the comic creators without sacrificing too much mobility. This is supposed to be a comic con - let's see the artists and writers given a little more prominent placing.